Meet Lindsay Gerszt, warrior mom and executive producer of When the Bough Breaks. After fighting a six-year long battle with postpartum depression, Lindsay Gerszt decided to share her personal journey in the newly released documentary about postpartum depression, When the Bough Breaks. This powerful and necessary film, executive produced and narrated by Brooke Shields, explores postpartum depression and postpartum psychosis through interviews with survivors, family members who have lost loved ones, mothers who have committed infanticide, and medical professionals. When 1 in 7 women suffer from some form of postpartum depression, we must do more. Lindsay has committed herself to raising awareness about postpartum depression and breaking the stigma surrounding maternal mental health so no mom has to suffer in silence and every woman receives the treatment she needs to get healthy and happy. As a fellow postpartum depression survivor, it was my honor to connect with Lindsay and learn more about why she chose to share her path to recovery on film and what she hopes to accomplish with the release of this documentary. Deciding to make this documentary I decided to make this documentary because I suffered from postpartum depression, postpartum anxiety and postpartum OCD. I lost many friends and felt completely alone. It broke my heart to think about all the women who suffer in silence and don’t have a voice. I wanted to give all of us a voice in this film. Sharing such a personal journey on film Sharing my personal story in the film was very difficult. I was concerned about the stigma attached to mental illness, which I have suffered from since I was a small child. While we filmed, I decided not to think about the outcome or about people seeing me be so vulnerable. I couldn’t. The idea of the world seeing me so open and honest was too hard at the time. We show me in some very real and scary situations (especially getting TMS therapy). After the film was completed and I saw the final version I couldn’t have been happier. It was so worth sharing my story and helping fight the stigma. Life post-filming Depression is a battle that I will always have to fight. I work hard every day to see the light in the darkness. Since we made and completed the film, with all the different treatments I’ve had, I learned what is the right fit for me. I am someone who will always have to take medication to live and I am okay with that. For what I went through and continue to go through, I am doing very well and I’ve learned to change the negative moments into learning experiences. The most difficult part of the filming process The postpartum psychosis interviews. I had not known enough about PPP or had personally known anyone who had been affected by it. Meeting the husbands, the children and the mothers who suffered changed the way I view EVERYTHING. These were people just like the rest of us who suffered such pain and in some cases, such extreme loss because of this unfair illness that they had no control over. I cry to this day thinking about my dear friend Naomi Knoles and will never stop telling her story to help raise awareness for postpartum depression and postpartum psychosis. Being a new mom is overwhelming as it is. There is a lack of sleep, a loss of your old life, a change in your relationship with your partner, a body that has changed and so much more. If you are having a hard time remember, it will get better and you will be ok. Open up. Talk to people you trust and if you are having feelings that frighten you or concern you please reach out for help. You are not alone! The power of the film’s survivors and their families coming together The scene at the end when many of the survivors and their families came together was an incredible moment. We hadn’t seen some of them in quite a while and to hear everyone open up and talk about what sharing their story was like for them was very powerful. We saw fighters, warriors and heroes. We saw family members showing the support that we all need. It was one of my favorite scenes we filmed in the entire film. The purpose of When the Bough Breaks I hope that with the release of When The Bough Breaks we keep this important conversation going. When you think about it there is nothing more important than a new mother’s or father’s mental health. We need our moms and dads to be well so they can take care of their babies. With up to 1 in 7 new mothers experiencing some form of a perinatal mood disorder, we need everyone to see this film and educate themselves. Know the signs and what to look for. Most importantly, we hope that the film helps break the stigma! If you suffer from PPD, you are not “crazy.” Don’t be afraid to share your story. If you open up, you will see how many others will too. Keeping the conversation about maternal mental health going The conversation about maternal mental health should never stop. Keep opening up and sharing your story. Keep asking how the new mom you know is doing. We need to make sure all doctors, nurses and hospitals learn and understand perinatal mood disorders. We need to make sure that when the baby is seen by his or her pediatrician that the doctor is also looking at the mother to make sure she is doing okay. Keep talking and fighting to create awareness. And please share When The Bough Breaks so we can further help create awareness, help break the stigma, and give our moms a voice! When the Bough Breaks is available now to stream on Netflix. 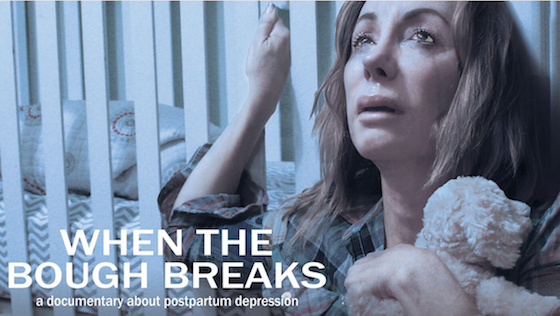 Please watch and share this important film about postpartum depression. This documentary isn’t just for new moms. It’s for everyone. These moms are our daughters, granddaughters, sisters, and friends. It’s up to all of us to educate ourselves about postpartum depression, the signs to look for, and the best ways to support the new moms we know and love. Do you know a new mom struggling with postpartum depression? Click here to receive your free copy of my WTF are Postpartum Depression and Anxiety: The Friends and Family Guide For How to Help, What to Do and What Not to Say. BIO: Lindsay Lipton Gerszt was born and raised in Miami, Florida. In 1997, she graduated with a BA from the University of Miami, where she majored in Communication and Sociology. Because of her love for music and the arts, in 1997, she began her career in Los Angeles at Capitol Records doing A&R. In 1999, she worked at MCA records and in 2003 she worked as a music manager at The Firm. Lindsay had the pleasure of working with, managing and doing PR for some of the biggest artists in the music industry. In 2007, she stepped back from the music industry to begin her family. It was at this stage in her life that she came face to face with postpartum depression. She has now committed herself to raising awareness for PPD, it's many faces and the path to a healthy life and family. Her commitment to PPD has included working on the important film,When The Bough Breaks-a documentary about postpartum depression. This work has included fundraising, producing and telling her story, along with helping other women tell their story. This work has become her passion.